Stock­ton Civic Theater’s Willie Awards, named tongue-in-cheek after William Shake­speare, were founded in 1953 as a means of rec­og­niz­ing the pro­duc­ers, per­form­ers and tech­ni­cians of SCT shows. An anony­mous panel of judges attends the Season’s six pro­duc­tions, then votes for the recip­i­ents they feel are most deserv­ing of recognition. On Sun­day, July 31, SCT will hold its Annual Willie Awards pre­sen­ta­tions to honor indi­vid­u­als for out­stand­ing achieve­ment dur­ing the theatre’s 2010–2011 Sea­son. The pro­gram will fea­ture per­for­mances by the theatre’s actors in open­ing and clos­ing num­bers and between pre­sen­ta­tions of awards. Please come pre­pared and dressed for a first class event and the gala cel­e­bra­tion of a mile­stone in the theater’s history. A list of nom­i­nees is avail­able on the SCT website. Tick­ets can be ordered by call­ing the Box Office at 473‑2424 or online 24/7 at www.sctlivetheatre.com. This entry was posted in General Information on July 25, 2011 by stocktoncivictheatre. Frankie is the leader and care­taker of the group. He has the most con­fi­dence and takes care of his fel­low Plaids. The clown, the imp, the scamp. The cut-up of the group. The shy one. He is usu­ally ter­ri­fied. The other Plaids are very pro­tec­tive of him. The wor­rier. He wor­ries about every­thing and is dyslexic when it comes to telling his right foot from his left! This entry was posted in General Information on July 19, 2011 by stocktoncivictheatre. 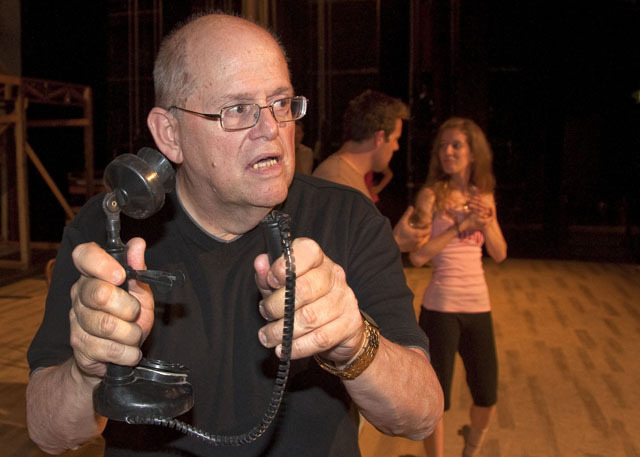 Direc­tor Jim Cole­man demon­strates use of an old-fashioned hand­set at an early 42ND STREET rehearsal. Lead char­ac­ters Jacob Bron­son (Billy Marsh) and Joy Clark (Peggy Sawyer) are in the background. Steven Orr, in the role of Julian Marsh, uses the tele­phone to call an “old buddy” for rein­force­ments. Eddie Har­g­reaves (as song­writer Bert Berry) approves. It may seem that the mechan­ics of talk­ing on the tele­phone would be a fore­gone con­clu­sion for actors in a musi­cal com­edy. That wasn’t nec­es­sar­ily so in the early pro­duc­tion phases of 42ND STREET, where direc­tor Jim Cole­man found it nec­es­sary to demon­strate the proper use of old-fashioned tele­phone “hand­set” receivers to cast members. The old-time tele­phone instru­ments are used through­out the pro­duc­tion, in which the retro look of the 1930s depres­sion era sets the scene for the action. 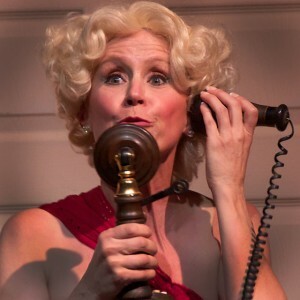 Melissa Esau, as Dorothy Brock, uses an antique phone to search for her miss­ing lover. In just three days of per­for­mances, 42ND STREET has become a local com­mu­nity the­atre sen­sa­tion, and the buzz on the streets says that most shows will play to full houses. 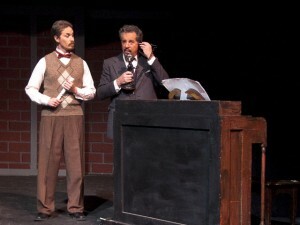 Get your tick­ets now, at the SCT Box Office, (209) 473‑2424, or online at sctlivetheatre.com. The Box Office at 2312 Rose­marie Lane is open 9:00 a.m. to 1:00 p.m., Tues­days through Fri­days, and two hours before cur­tain time. The online box office is avail­able 24/7. See you at the show! Just give our Box Office a call! This entry was posted in General Information on July 2, 2011 by stocktoncivictheatre.